Three days after unveiling a sizable new figurine based on the popular League of Legends character, Riot Games decided to cancel the statue’s release in the face of strong criticism from fans. The problem? People were upset by the statue’s face, which barely resembles the character it’s meant to portray. 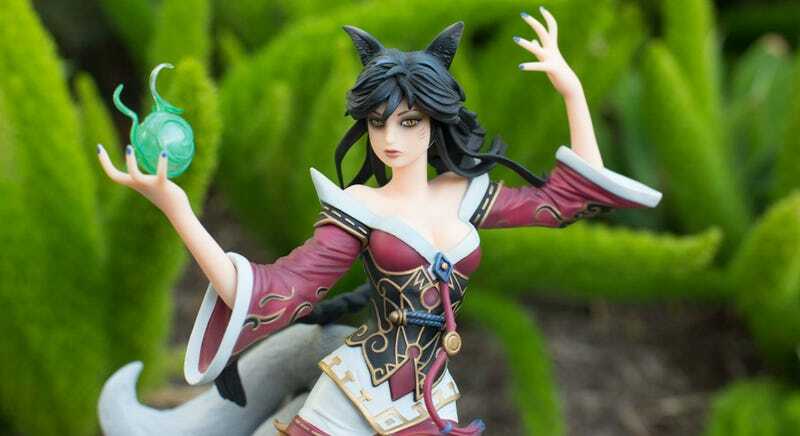 While some fans poked fun at the Ahri statue’s oddly elongated neck with memed-up images like the one seen below, the biggest issue people had with the figurine was its facial features. Her eye makeup was so heavy that one fan writing on Twitter joked that she looked like “an insomniac” with huge bags under her eyes. Others simply observed that it doesn’t really look like Ahri’s face. They have a point; her cheeks are far too round and her chin isn’t pointy enough to stand up to close scrutiny. We want our statues to be accessible to as many players as possible and are constantly evaluating techniques that will allow us to deliver awesome art at lower price points. For Ahri, the goal was to deliver an epic statue at a retail price significantly below our polyresin Twisted Fate piece — despite Ahri being similar in size and featuring greater sculpt complexity. To do this, we elected to make her body and face out of another material called PVC, which we used for the Thresh statue. Riot’s statement ended by saying that they hope to re-release the Ahri statue at some point in the future, but they have to figure out how to make it look better without significantly increasing its cost first.